Friday, October 9, 2015 – Week 6 of the college football season started last night. It’s a natural tendency for people to make connections between events. “When I do this, that happens…” Primitive people developed superstitions in similar ways. One year, the crops were bad. The next year, they put a basket of dead birds in the middle of the field, and everything turned out great. Therefore, placing a basket of dead birds in the field ensures a good crop… Like the primitive farmers, we continue to make assumptions of causation [which] leads us to think that prayer works (you pray for your sports team to win…) [But we should] not jump to conclusions. We should make multiple observations. We should try different sequences in various combinations… Even with all that, we might never be sure about the real causes. But we can rule some out, and … increase our confidence in others. The thesis is an intellectual proposition. The antithesis is simply the negation of the thesis, a reaction to the proposition. The synthesis solves the conflict between the thesis and antithesis by reconciling their common truths and forming a new thesis, starting the process over. The “Touchdown Jesus” image is courtesy of Gallery … University Of Notre Dame Touchdown Jesusimgarcade.com. Another note: The text of this post was gleaned from other posts in my first blog, Dorscribe.com, including On the readings for September 28, Reflections on a loss and “God’s Favorite Team” – Part I. 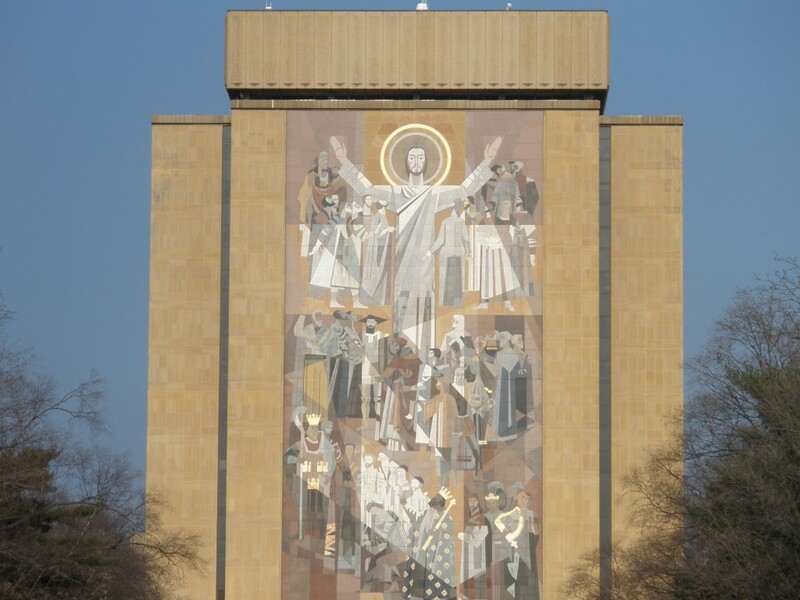 The “Touchdown Jesus” image is courtesy of Word of Life Mural // Hesburgh Libraries // University of Notre Dame. See also Notre Dame Stadium – Wikipedia, the free encyclopedia. Sports fans, for all the ribbing they take, do have some decidedly positive mental health advantages over non-fans. Evidence cited by [Kent State University researcher Shana] Wilson and her co-workers supports the idea that fans who strongly identify with a team, particularly a local one, are less lonely, feel happier, and feel better about themselves. The “SM” chart is courtesy of Scientific method – Wikipedia, the free encyclopedia. The lower image is courtesy of Bud Light Only Weird – Image Results. If you want to see some [sport superstitions], just go to a baseball game. Baseball players … are renowned for their superstitious behavior. Babe Ruth, famously, always touched second base when he came running in from the outfield… Over the years, players’ superstitious habits have become, if anything, even more extreme. Before each game, for instance, former Red Sox third baseman Wade Boggs … always practiced batting and wind sprints at the same time of day (5:17 p.m. and 7:17 p.m., respectively), left his house at the same time on game days, and drew the word “Chai” (Hebrew for “life”) in the dirt before coming up to bat (and Boggs isn’t Jewish). Likewise, All-Star slugger Jason Giambi had a cure for hitting slumps: gold lamé thong underwear, which must have been quite a sight in the locker room. So what are you saying, “Mr. Pessimist?” That Babe Ruth and Wade Bogs are evil? Hah? This entry was posted in Not your Daddy's Bible on October 9, 2015 by bbj1969per@aol.com.